Ron Stabinsky, a pianist from Pennsylvania, has been working in recent years with jazz upstarts Mostly Other People Do the Killing, debuting on 2013's excellent Red Hot. Not only is he from the state that is band leader Moppa Elliot's source of inspiration, but his approach to playing contains the sly and subtle irreverence that has so successfully fueled the group over the years. He is heard solo on Free For One, where all of the musical ideas that make him a fit with the band are channeled into a more personal and expressive vein. Beginning with 'After it's Over,' the eight improvised tracks all are of a piece, yet have their own logic and feel in a way that makes each one unique and part of an exciting collection of improvisations. Deliberate single note lines from both hands counter each other, their flow punctuated by bluesy passing tones and jolting chords. Not as violent or stabbing as say Cecil Taylor's approach can sometimes be, the feel though is hardly placid. On the second track, '31', the approach changes, not as sparse, but yet not dense, there is a great deal of motion and rhythmic ideas happening. The track 'Viral Infection' begins with an almost catchy melodic hook while bright and arresting chords pop out sporadically. By the time we're at end, 'Not Long Now Long Now' and 'Rapture', the attack on the keyboard has intensified and we are very much - and wonderfully so - in that aforementioned Taylor territory. Throughout the album, the energy and pulse keeps the music flowing and the changing textures and volume of ideas keeps it engaging. 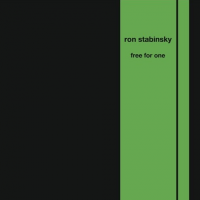 Beautifully recorded and austere in its red and green package, Free For One is an excellent new addition to the solo piano oeuvre. Nice review Paul. Very insightful and well written. Makes me curious to check out the CD. Thanks. "Occasionally One Person Does the Killing" ?